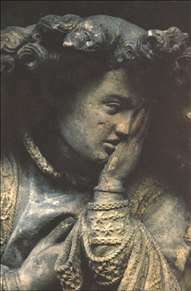 Influential master of early Netherlandish sculpture, who moved beyond the dominant French taste of the time and into highly individual monumental, naturalistic forms. The works of Claus Sluter infuse realism with spirituality and monumental grandeur. His influence was extensive among both painters and sculptors of 15th-century northern Europe. Born in the mid-14th century, Sluter is known through his works rather than accounts of his person. 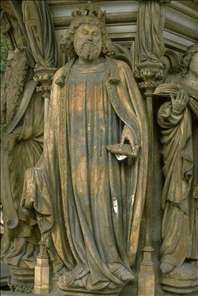 He is thought to be the Claes de Slutere van Herlam (Haarlem) who was listed in the records of the stonemasons guild in Brussels about 1379. From ducal archives he is known to have entered in 1385 the service of Philip II the Bold, duke of Burgundy, who was ruler of the Netherlands and regent of France in the last decades of the century. Philip founded the Carthusian monastery of Champmol at Dijon in 1383 and made its chapel a dynastic mausoleum adorned with sculpture by Sluter. All of the surviving sculpture known to be by Sluter was made for Philip. 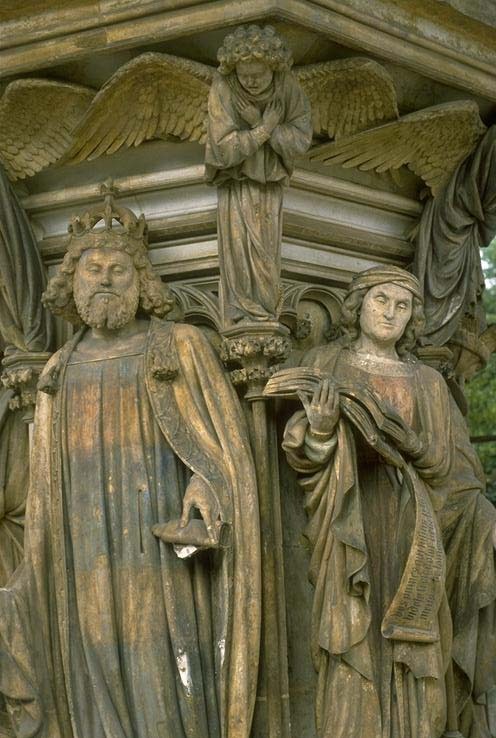 Two compositions are still to be found at the site of Champmol: the figures on the central pillar that divided the portal of the chapel show the duke and duchess presented by their patron saints John the Baptist and Catherine to the Virgin and Child; the Well of Moses in the cloister consists of the remains of a wellhead that had been surmounted by a group showing the Calvary of Christ. 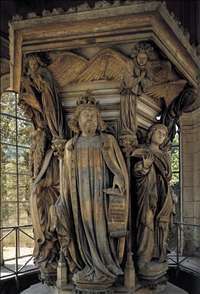 The other extant work is the duke s own tomb, which once stood in the chapel at Champmol but which has been reassembled in the Museum of Fine Arts in Dijon. Sluter, an innovator in art, moved beyond the prevailing French taste for graceful figures, delicate and elegant movement, and fluid falls of drapery. In his handling of mass, he also moved beyond the concern with expressive volumes visible in the sculptures of Andr Beauneveu, an eminent contemporary who worked for Philip s brother Jean, Duke de Berry. The grandeur of Sluter s forms can only be paralleled in Flemish painting (by the van Eycks and Robert Campin) or in Italian sculpture (by Jacopo della Quercia and Donatello) several decades later. The portal of the Champmol chapel is now somewhat damaged (the Virgin s sceptre is missing, as are the angels, once the object of the child s gaze, holding symbols of the Passion). This work, though begun by Marville, must have been redesigned by Sluter, who set the figures strongly before an architecture with which they seem intentionally not closely aligned, the doorway becoming a background for the adoring couple of Duke Philip and his wife. This transforms traditional portal design into a pictorial form in which architecture has become a foil, the framework for a figured triptych. Projecting canopies and jutting corbels carved with figures, deep undercuttings, and swirling draperies aid Sluter s dynamic naturalism. This is a weighty, massive art of dominantly large, balanced forms. 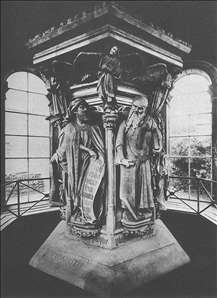 The six-sided "Well of Moses," now lacking its crowning Calvary group, which made the whole a symbol of the "fountain of life," presents six life-sized prophets holding books, scrolls, or both. 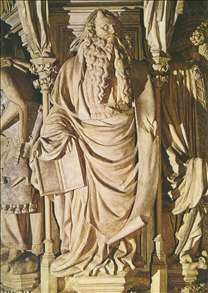 The figures, beginning with Moses, proceed counterclockwise to David, Jeremiah, Zechariah, Daniel, and Isaiah. 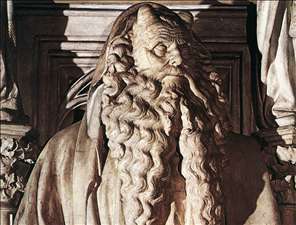 Moses was placed directly below the face of Christ, and the location of Zechariah, father of John the Baptist, was at Jesus back, as befits a precursor. Zechariah looks down sadly as Daniel vigorously points to his prophecy. On the other side of Daniel, and serving to balance Daniel s passionate temperament, is the calm reflective Isaiah. This juxtaposition reveals Sluter s use of alternating naturalistic balances. The head and torso fragment of Christ from the Calvary reveal a power and intensity of restrained expression that conveys overwhelming grandeur. Suffering and resignation are mingled, a result of the way the brow is knitted, though the lower part of the face, narrow and emaciated, is calm and without muscular stress. The "Well of Moses" was originally painted in several colours by Jean Malouel, painter to the duke, and gilded by Hermann of Cologne. The figures of the composition dominate the architectural framework but also reinforce the feeling of support that the structure provides through their largeness of movement. 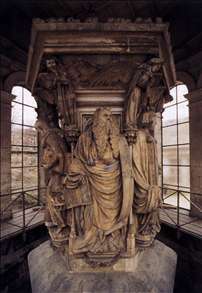 Sluter s latest preserved work, the tomb of Philip the Bold, was first commissioned from Jean de Marville, who is responsible only for the arcaded gallery below the sepulchral slab of black marble from Dinant. Forty figures, each about 16 inches (41 cm) high and either designed or executed by Sluter, made up the mourning procession. 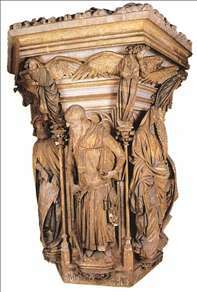 Not all the figures are still in position at the tomb; three are lost, three are in the Cleveland Museum of Art, and one is in a French private collection. 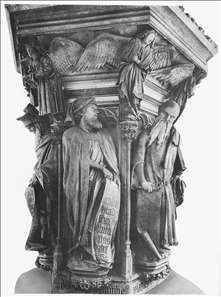 They served as models for Sluter s nephew Claus de Werve, Juan de la Huerta, and other artists for sculptured tombs in France and beyond its borders. Sluter did not invent the mourning procession nor did he design the setting. But he conceived of the figures as pleurants (weepers), of whom no two are alike; some are openly expressing their sorrow, others are containing their grief, but all are robed in heavy wool, draping garments that occasionally veil a bowed head and face to convey a hidden mourning. Spiritualist and naturalist in one, Sluter epitomized in sculpture the growing awareness of an individualized nature with discoverable laws and an enduring grandeur. See more details about "Well of Moses"
See more details about "Well of Moses: Prophets Daniel and Isaiah"
See more details about "Well of Moses: Moses"
See more details about "Well of Moses: Moses "
See more details about "Well of Moses: Prophets David and Jeremiah"
See more details about "Well of Moses: Prophet David (King David)"
See more details about "Well of Moses: Angel"